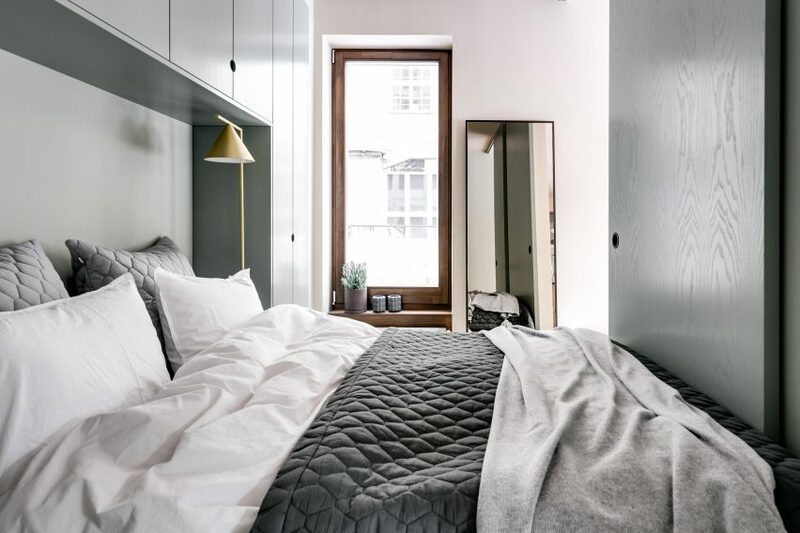 Called the Mono apartments and commissioned by construction company Glommen & Lindberg, the building was designed by local architects Koncept Stockholm, with Stockholm-based Note Design Studio creating the interiors. The building has a restaurant that opens to the street on the ground floor, with 59 two- and three-bedroom apartments above it, which measure from 23 to 74 square metres. A penthouse and communal rooftop terrace are on the upper floors. Note Design Studio set out to create living spaces with a “hotel ambiance” and plenty of room for entertaining guests. The designers said they wanted all aspects of the building to work together to create a cohesive aesthetic, from the faceted wood and concrete facade, to the interior detailing. 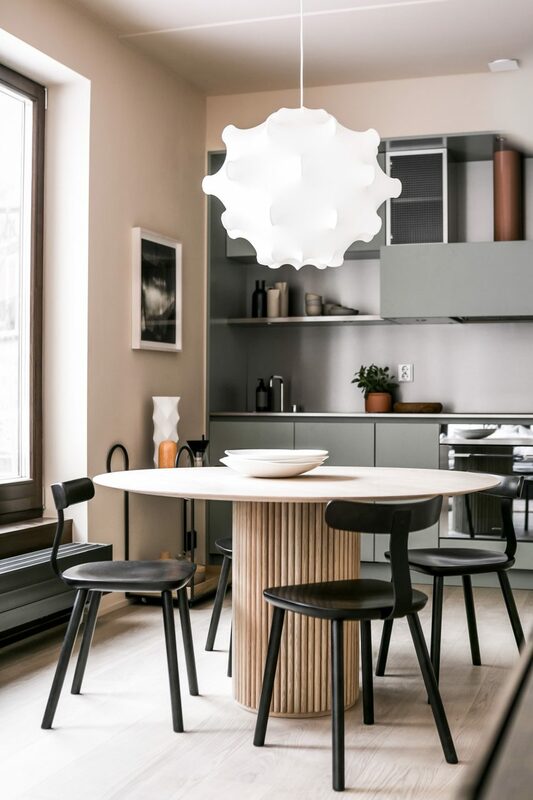 “We wanted the interior in this project to have as much love and quality as the exterior,” Daniel Heckscher, interior architect at Note Design Studio, told Dezeen. “One of the challenges has been to make the interior solution as sustainable and captivating as the innovative facade, and to collaborate with others on an integrated building with a distinct character,” continued Heckscher. Despite the apartments’ small footprints, the studio wanted to create enough space for residents to invite “many friends” over for long dinners. They did this by creating one bright open-plan living, kitchen and dining space, which is wrapped by tall windows on two sides. 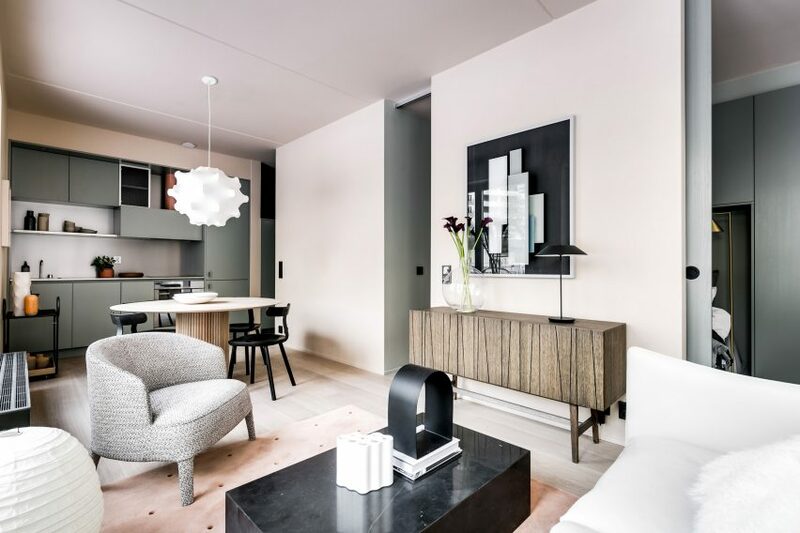 A neutral colour palette made up of subtle light pink, green and grey paint, oak plank flooring and stainless steel helps to create a calming atmosphere throughout the apartments. “We’ve put time and effort in everything from the walnut skirting under the windows to the special laquered heaters,” said Heckscher. “Basically, there’s no white in the whole building and almost everything put in is treated in a non-standard way, to create a beautiful pallette and a solid concept,” he added. 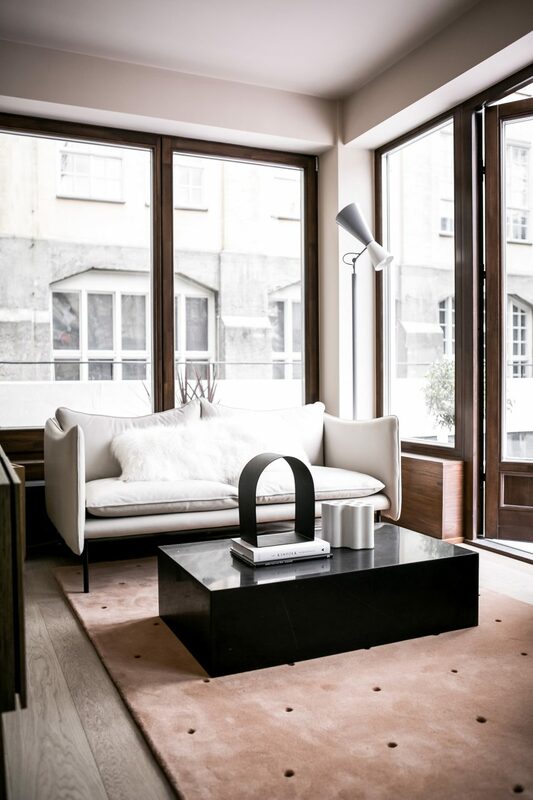 Details range from leather clad railings, and brass details in the lighting from Örsjö and door knobs. Located off the living room, the bedroom has two sliding door entrances that provide access on either side of the bed. 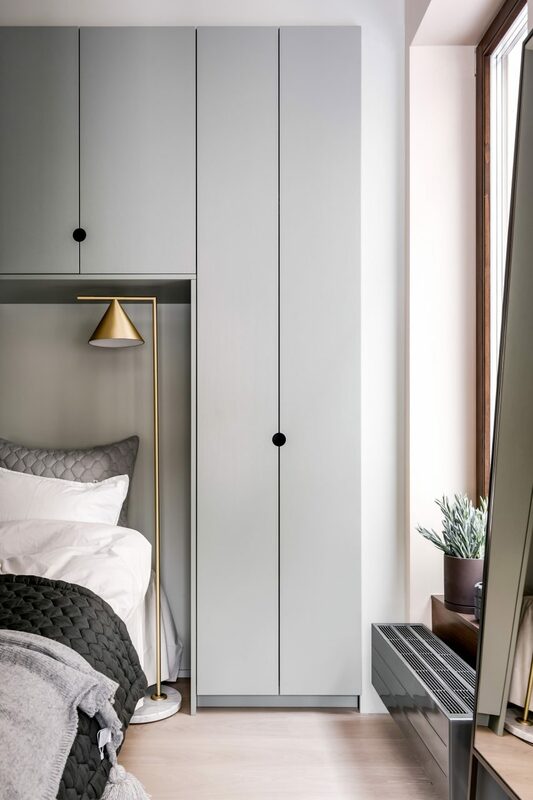 Spanning the full length of the room, the bed is framed by built-in lacquered ash veneer cabinetry with circular cut-out handles designed by Note and built by Swedish homeware brand Asplund. In the bathroom, the upper half of the space is lined with Barber Osgerby’s herringbone mews tiles for Mutina in a pale pink while the bottom half is clad using the same tiles in dark grey. “This is a tile that is not only 5-10 times more expensive than a standard tile for this type of project, but also takes 2-3 times longer to install,” Heckscher told Dezeen. Note Design Studio worked with Asplund to create the bathroom vanity and wall-mounted cabinet, which feature the same cut-out handle design that is used in the bedroom cabinetry. All of the apartment’s inner doors were made-to order in ash while all sliding doors are full-height to the ceiling. 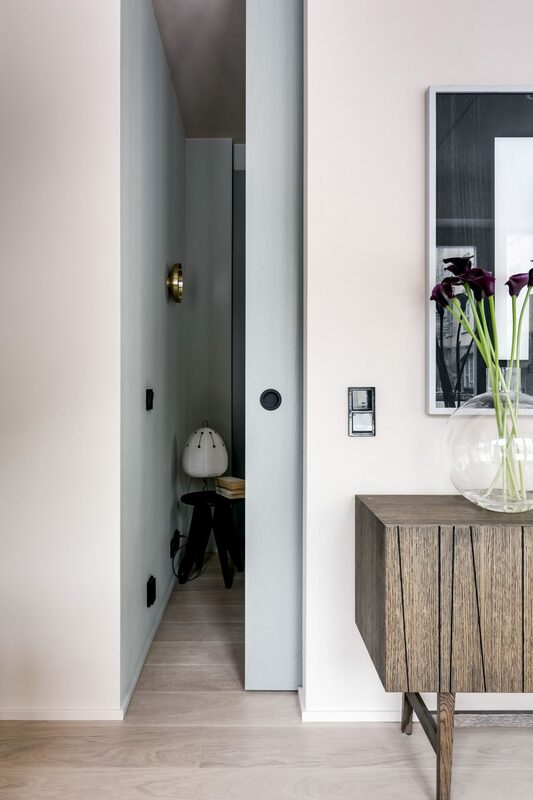 While the functionality of the spaces is described as typically Scandinavian the apartments’ playful design solutions – such as the cut-out door handles and colourful details – are described as being “continental” in spirit. Also designed for small-space living, Note Design Studio’s recent bathroom collection for Korean brand Lagom Bath is intended for homes in Asian cities. Be the first to comment on "Note Design Studio’s small city apartments are designed for socialising"